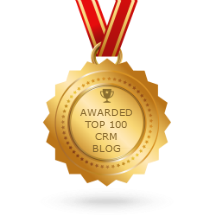 If you know at least something about CRM industry, probably you’ve heard of such giants as SugarCRM and Salesforce.com. Both companies occupy a solid place on the market, have strong reputation and numerous awards, develop high-quality CRM solutions and among their customers are thousands of companies of various sizes and industries that are loyal to the brand. When you choose between two such authoritative vendors, a question can present itself: “Is there any difference at all?” The answer is given in today’s post. As for the functionality of both CRM systems, it is, undoubtedly, much applauded by every customer: many functions, vital for sales, marketing and service departments, are available both in Sugar and Salesforce systems. In addition, both vendors offer integration with third party apps; mobile client is also provided. Nevertheless, there is a number of major differences between Sugar and Salesforce. First – the choice of deployment model. Salesforce provides a single option – cloud. Although cloud CRM solutions are in high demand now, due to various reasons (for example, specific requirements to data safety and security), some companies still prefer to choose between a wider range of options which is ensured by SugarCRM – namely On-Demand, Public Cloud, Partner Cloud and On-Site. A lot of space for deployment, isn’t it? Second – the cost. SugarCRM and Salesforce.com have the 1 user/month annual subscription system. Below is the app for Sugar Enterprise and Salesforce Enterprise editions, which calculates the cost difference between the systems based on the number of users. As you can see, the calculations prove the exceptional affordability of Sugar as compared to Salesforce. 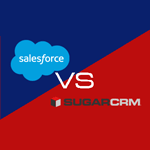 Moreover, SugarCRM developed the Sugar PurePrice® concept, the idea of which is to guarantee transparent and simple pricing, while Salesforce.com may introduce hidden costs, caused by the proprietary nature of the software. It should be admitted that Salesforce also has its advantages over Sugar. If we compare the abovementioned Sugar Enterprise and Salesforce Enterprise editions, Salesforce can boast AdWords monitoring function, as well as built-in integration with LinkedIn (it can be customized within Sugar). In turn, Sugar offers advanced user interface Sugar UX™, which significantly excels the outdated Salesforce solution. Sugar UX™ is designed to help every customer-facing employee perform their work more efficiently and faster: for this purpose the interface is equipped with the Intelligence Panel, displaying relevant analytics on each Contact, Lead, Opportunity or Account, as well as with Activity Streams, that improve the efficiency of collaboration. Another fundamental difference between Sugar and Salesforce CRM systems is advanced workflow functionality that allows automating complex business processes, such as case escalation, contracts approval, payments control and more. What is more important, the usage of the mentioned functionality does not require IT staff, which means it can be applied even by an average employee.